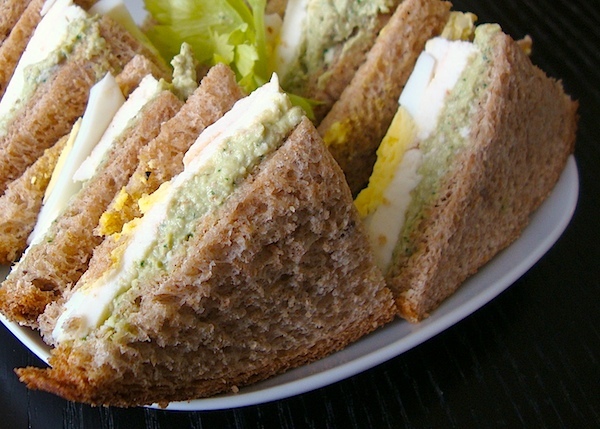 Lay 3 slices of bread on a flat surface and spread with a thick layer of the avocado hummus. Add shallots, fresh mozzarella, and eggs. Season with sea salt and black pepper. Add bread and cut into 4 quarters. Remove pit and skin from avocado and chop into small pieces. Blend avocado, almonds, garbanzo beans, garlic, yogurt, parsley, and lemon juice, while streaming in oil until you've reached the consistency you desire. Season with sea salt and black pepper. Keep refrigerated. Drizzle extra virgin olive oil on top to serve.